In the four years since XTC began, the band's youthfully aggressive, revved-up white-noisy style has settled like dust around an industrious sculptor, leaving a finished product that combines streamlined originality with Beatles-type buoyancy. 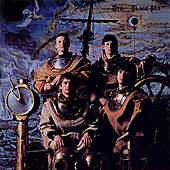 The typical XTC sound fuses Andy Partridge's and Dave Gregory's spasmodically vertical guitar lines, Terry Chambers' alert and unpredictable drumming and an overlay of pure-pop boy-group harmonies led by bassist Colin Moulding's British-modern theatrical tenor. In the past, these elements have come together most winningly in sporadic singles: "This Is Pop," "Meccanik Dancing (Oh We Go)," "Life Begins at the Hop," "Making Plans for Nigel." On Black Sea, the material is especially good, from the Kinks-style "Respectable Street" to the jarring, almost frightening rock-dub tune, "Living through Another Cuba," to the jubilant "Burning with Optimism's Flames." Only the overextended "Travels in Nihilon" strays from the intersection of punk and pop where XTC are most at home.